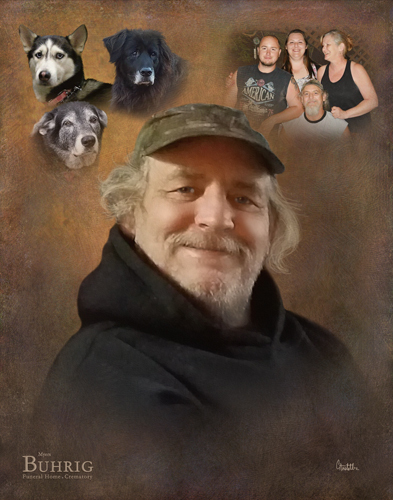 Douglas “Doug” Dean Kapp, age 56, of Dillsburg, and formerly of Mechanicsburg, passed away at home on Wednesday, September 12, 2018. Doug was born on Tuesday, July 25, 1962 in Mechanicsburg to Dennis Dean Kapp and Karen Lee (Ross) Kapp. He is preceded in death by his three faithful canine companions: Jazzy, Shianne, and Meeka. Doug’s survivors include his wife of 35 years, Lori Ann (Eshelman) Kapp; his two children: Nicholl “Nikki” Lynn Kapp of Missoula, MT, Brett Benjamin Kapp of Dillsburg; his parents: Dennis “Denny” and Karen Kapp of Mechanicsburg; his two siblings: Brian Kapp of Dillsburg, Julie Moore and her husband, Dave, of Hershey; several nieces and nephews; and his beloved canine companions: Pooch, Trixie, Tasha, and Sophia. Doug attended Cumberland Valley High School in Mechanicsburg. He loved being outdoors and spent a great deal of time hiking and camping. Doug was quite the handyman when it came to doing work outside of his home. He built ponds, decks, rock walls, a variety of birdhouses, and many other things. All are welcome to join Doug’s family at his viewing on Wednesday, September 19, 2018, from 12:00 p.m. until time of service at 1:00 p.m. at Myers - Buhrig Funeral Home and Crematory, 37 East Main Street, Mechanicsburg, PA 17055; with Chester Musser and Reverend Steve Wiggins officiating. Burial will follow in Chestnut Hill Cemetery in Mechanicsburg. Honored to be pallbearers are: Jeff Amos, Guy Hess, Brett Kapp, Brian Kapp, Nicholl Kapp, and Wicks. Doug’s family invites everyone to join them for time of food and fellowship at Hoss’s Steak & Sea House, 61 Gettysburg Pike, Mechanicsburg, PA 17055, following the burial. Please come as you are and feel free to dress casually. The family respectfully asks that contributions be made in Doug’s memory to help defray his final expenses. Donations of any amount are welcome and greatly appreciated. To donate, simply click on the green “Appeal for Donations” button on Doug’s obituary which appears on Buhrig.com. Donations by check can be made payable to Myers - Buhrig Funeral Home and Crematory, 37 East Main Street, Mechanicsburg, PA 17055. Credit card donations by telephone can be made by dialing (717) 766-3421. Doug’s family thanks you and Myers - Buhrig Funeral Home and Crematory for the financial support at this difficult time. Doug’s family has entrusted his care to Myers – Buhrig Funeral Home and Crematory in Mechanicsburg, (717) 766-3421. Read Doug’s full obituary, view his memorial video and portrait, and sign his official guest book at Buhrig.com.